You might like to top with some crumbled goats’ cheese or grated parmesan before you pop the peppers back in the oven for the final 5 minutes. 1Preheat the oven to 200°C, gas mark 6. 2Halve the peppers through the stalks, deseed and brush all over with 1 tbsp olive oil; season. 3Lay on a parchment-lined baking tray and roast for 20 minutes. 4Meanwhile, heat the remaining 2 tbsp oil in a large frying pan over a medium heat and fry the leek, garlic and thyme for 10 minutes, stirring regularly until soft and starting to turn golden. 5Tip in the capers and sun-dried tomatoes and stir for a minute, then add the lentils, turn up the heat and fry for another 5 minutes. 6Season and stir through the lemon juice, parsley and pistachios. 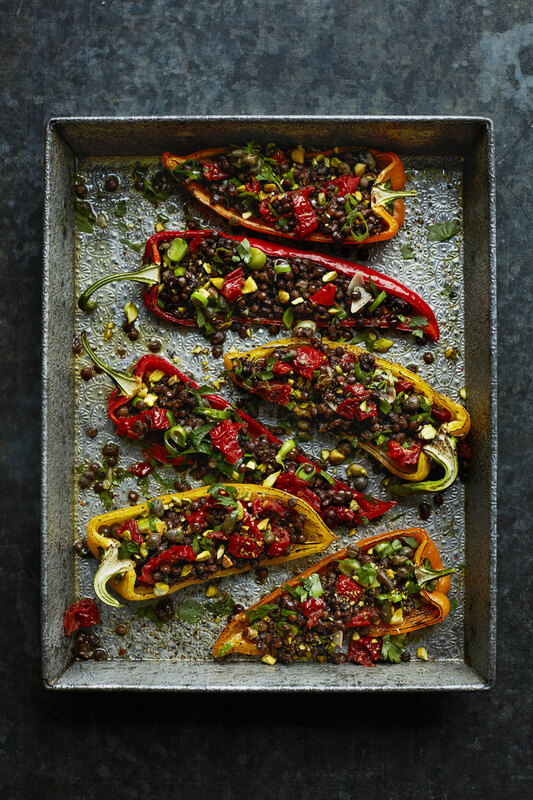 7Spoon the lentils into the peppers and return to the oven for 5 minutes. 8Serve with a green salad, if liked.